After an exceptionally cold and snowy January we have finally sown our first wave of seeds into the heated propagators. We held off during January because although the propagators are heated, the cold was so biting that we just felt happier leaving it until the snow and ice thawed. So, our first seeds were sown by Louise and her sister Sarah on January 26, where in a change from previous years we used the open-tray germination technique. The open-tray system is very simple and relies on filling a tray with multi-purpose compost, dibbing out shallow holes for each seed, one inch apart, dropping in the seed and sieving a fine layer of compost on top. We finish by watering using slightly heated water before sprinkling a light dusting of vermiculite to help retain moisture and inhibit mould growth. At time of writing we are yet to see any of the 800 seeds sprout, but within a few days we expect to see the early signs of life. We are hoping for a considerably improved germination rate now that we are using the open-tray technique. In previous years we used Jiffy Pellets, although we found them hard to control as some pellets took up too much water from our capillary mats while others just dried out. A good germination rate would be anything above 80 per cent. Once the seedlings have acquired their first true set of leaves, we will gently prick them out of the open trays before transplanting them into growing cells. They will then be left on our heated mats covered by fleece for additional insulation until planting out takes place in April. We will repeat this process at least five times, sowing a total of 4,000-plus seeds. 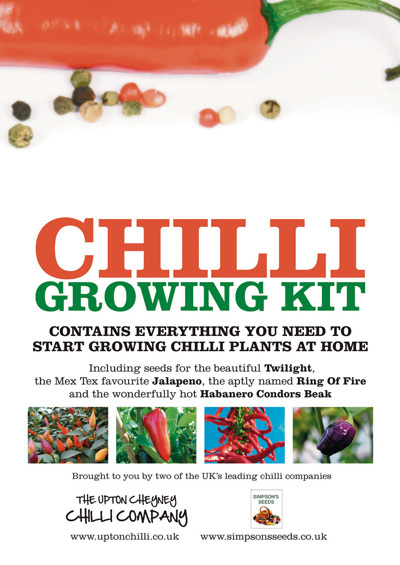 Growing chillies is massively rewarding, and as such we offer a Chilli Growing Kit that can be purchased via our website (www.uptonchilli.co.uk) or at Manor Farm shop by prior arrangement. Sowing chillies is recommended between January and the end of March so you have plenty of time to start growing!